Note: These CSS codes need to be pasted into the CSS box under "Customize Profile"
Question: I have a problem this code hides my music player but it doesnt hide the entire module, help please thanks. Note: You may have to adjust the -30 number at the end in order to make it work with your profile. Everyone's profile is a little bit different. 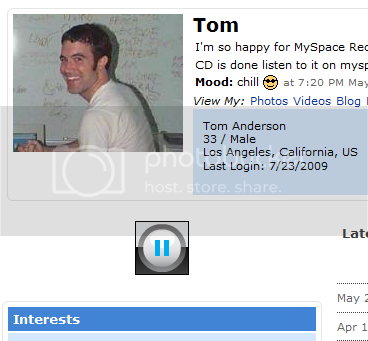 Note: This CSS code need to be pasted into the CSS box under "Customize Profile"
If you have a 10 song myspace playlist, but you want only the PLAY button to show, hiding the rest of the playlist, then this code is for you. If you want to Crop the music playlist AND have it centered in the column AND you want the previous and next buttons to be visible and clickable, then use this instead. If you just want to hide the right side of the playlist, so that people cant add your songs easily, use this next code instead.